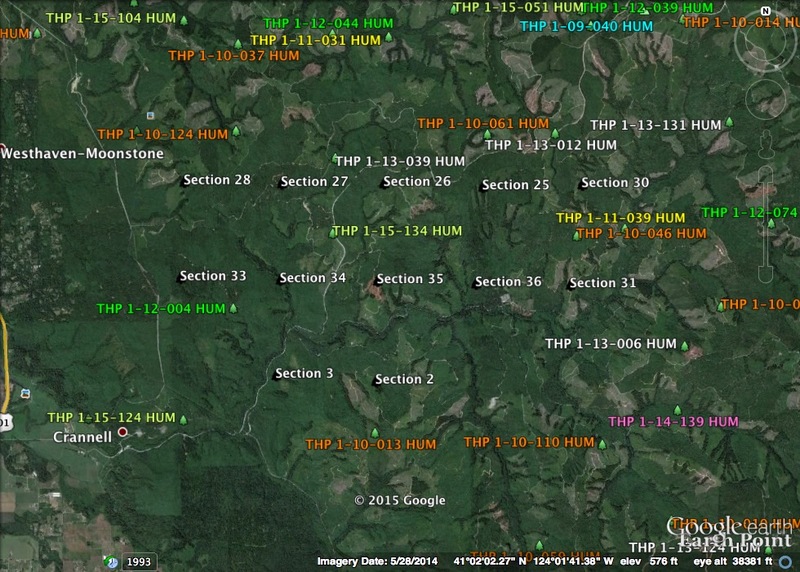 THPBlog: Green Diamond Resource Company to log on steep and unstable slopes near Trinidad, CA. Green Diamond Resource Company to log on steep and unstable slopes near Trinidad, CA. This THP is about 4 miles east of Trinidad, CA and a dozen miles north of Arcata, CA at an elevation of 200 to 1,400 feet. Green Diamond Resource Company is planning a tractor and cable logging operation on steep and unstable slopes in redwood, Douglas fir and Sitka spruce forests. There are unstable areas in the northern portions of units C and J, and seven road failure sites including fill failures along the CR2300, CR2310 and CR2613 roads. 21 road drainage sites are planned for work including rocking, dip construction, culvert repair/replacement and re-construction of washed out crossings including sink holes, diverted channels and fill failures. An osprey nest is located within 160 feet of unit C, and within .25 mi of the CR1300 Road. A western pond turtle was observed 1.6 mi SW of unit D, and fisher sightings were reported between the years 2001 to 2010 in units D, E, H and J. More information is available on the THP Tracking Center website.